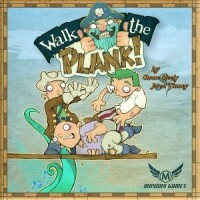 BoardGaming.com> Games> Card Games> Walk the Plank! In Walk the Plank!, players represent the worst pirates in a captain's crew. The captain has rounded you all up because you're all lazy and stupid and simply not worth the rum and loot you get paid. That said, the captain has decided he's willing to keep two of you in his crew. To prove you're worthy, you will fight among yourselves, trying to shove other players' pirates off the end of the plank while keeping yours alive! Ok, not really – I had a blast!! You look through your cards and select the 3 actions you want your pirates to perform in a sort of robot rally type thing and mayhem ensues. The first player turns over his/her top card and one of his pirates perform this action. Then the second player goes and so on until everyone has revealed each of their cards in turn. The captain’s favor passes counter clockwise and the players return their cards to their hands unless the cards state otherwise and the next 3 cards are chosen. The cards say things like Shove Left, Shove Right, Extend/Retract plank, Drag to sea, Pull to ship, and ones where pirates advance or retreat, or just charge! This makes for some fairly random events, but I really enjoyed it. There is a lot of player interaction and my group enjoyed the wanton mayhem and general silliness. There is little strategy because of the randomness of card selection of the other players. We had a great time but only see this as a bit of mindless filler that really gets us laughing! I pledged for this one on Kickstarter! This is a fun one to break out with the family after dinner. The decision-making is fun. You must try to read your opponents to figure out what they might do so you don’t get caught up in someone else’s decision. Not being able to choose every card two turns in a row makes for some tough choices. The only critique I have is that the pirate meeples are not all uniformly cut so the stickers don’t always line up. Add a Review for "Walk the Plank!"